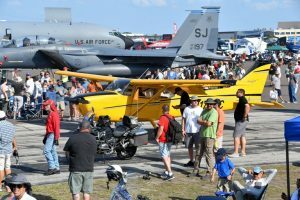 Proceeds from events held on the SUN ’n FUN Expo Campus fund over $2 Million annually in aviation Scholarships and Education Programs at the Aerospace Center for Excellence. 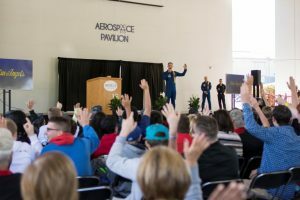 At the SUN ’n FUN Expo Campus, The Sky is the Limit! 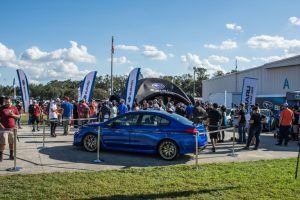 The SUN ‘n FUN Expo Campus is the perfect year-round venue for a wide variety of events. We have both indoor and outdoor facilities to accommodate any occasion. 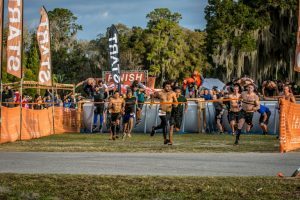 Planning a corporate event or fundraiser? 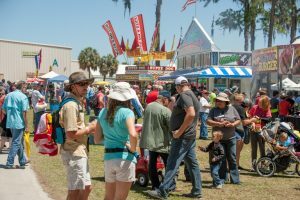 Looking for a new home for your annual festival? SUN ‘n FUN has a unique space for almost any event, whether your guest list is 25 or 25,000! Our hospitality department will work with you to make sure your celebration or corporate event is perfect in every way. 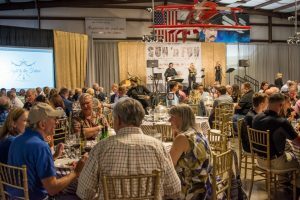 A hangar is not always an airplane hangar, it can be transformed to a upscale set-down occasion that includes a dance floor with chandeliers… an auction venue, exhibit hall, even a dog show runway. 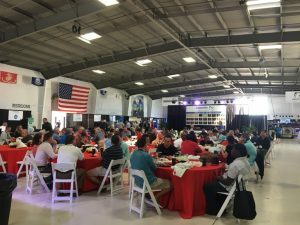 With over 20,000 sq.ft., this facility can host sit down parties over 250 people OR other activities with an excessive need for space. And… of course, airplanes can be provided as a backdrop for any event! 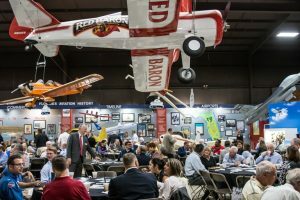 We will work with you to make the Skylight Hangar the starting point for your most memorable event. Are you ready to “Let the Good Times Soar?” For more information, or to book your event, please call our Events Logistic Manager at 863-644-2431 ext. 125 or email eventrentals@flysnf.org. 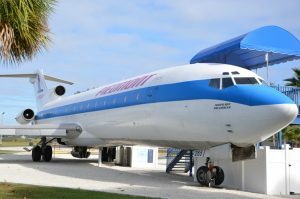 Home of the personal aviation collection of Howard Hughes, the Aerospace Discovery at the Florida Air Museum is a facility like no other. 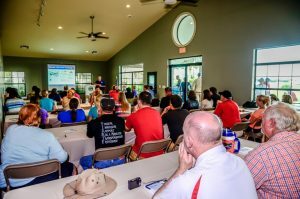 This venue provides many opportunities to plan the perfect, unique event that will guarantee success! A tour of the museum can also be planned as part of your guest’s experience. 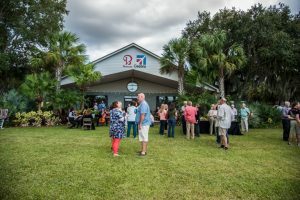 Are you ready to “Let the Good Times Soar?” For more information, or to book your event, please call our Events Logistic Manager at 863-644-2431 ext. 125 or email eventrentals@flysnf.org. 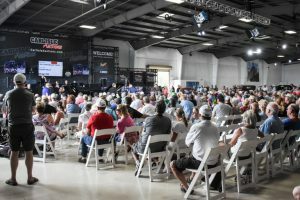 The open-air pavilion includes more than 10,000 square feet of covered open-air space, providing your exhibition, holiday function, theme party, convention, wedding or other special event a spacious area to entertain. 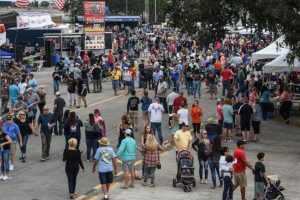 A complete food and beverage serving area, large stage, storage facility, loading dock, restroom and ample parking make this a convenient and attractive location for larger events, day or night. This rental is for the Pavilion only and includes use of the kitchen. *Restrooms are not available for events with over 200 people attending. Porta-potties must be rented by client for parties of 200 or more. 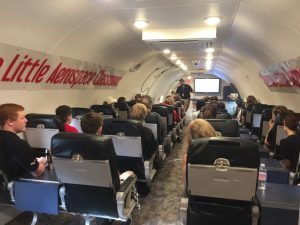 This converted Boeing 727 is the perfect aviation-themed classroom that provides seating for 26 and audio/visual support for the presenter. This aircraft has a working cockpit visible from the classroom area, we can even start the engines! 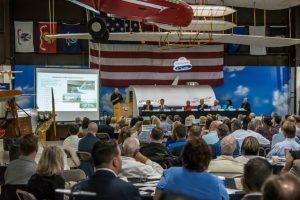 The conference room space affords a great aviation-themed meeting area with a converted aircraft wing conference table and aircraft seats. This space seats 14 comfortably. Why not have your next meeting or presentation here? 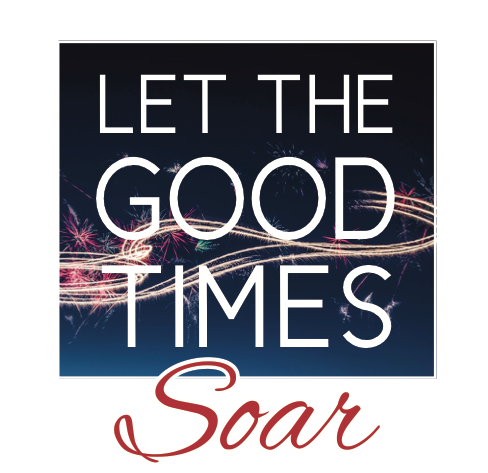 Are you ready to “Let the Good Times Soar?” For more information, or to book your event, please call our Events Logistic Manager at 863-644-2431 ext. 125 or email eventrentals@flysnf.org. 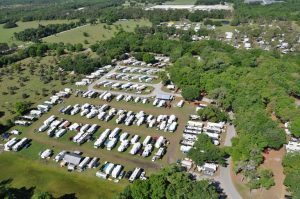 Similar to commercial campgrounds around the nation, the SUN ‘n FUN campground can be designed to meet the needs of your guests. Consider tent camping, RV dry camping with water, RV camping with full hook-ups (approx. 75 electrical spaces), shower houses and activity fields. A stage and firepit is also available. RV Dry Camping – $25 plus tax per day for dry camping (water spigots are available). RV Camping with Hook-ups – 6 electrical spaces available – $35 plus per day. 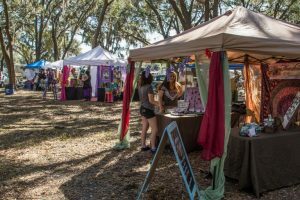 Vendors attending your event whether they are food vendors or product vendors will be charged a $5 per linear foot fee of display space per day. Portable toilets must be rented by client. Port a potty rental required. “Pack out your trash” required. 1 parking space per tent allowed. Additional charges apply for use of any other SUN ‘n FUN building or structure. $25 plus tax per night for dry camping. Dump station is available on site. 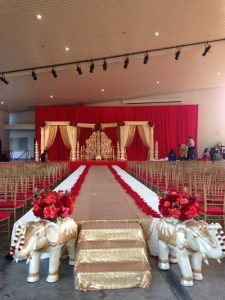 All equipment including Tables, chairs, linens, china, décor, portalets, etc.are your responsibility unless other arrangements are made through the facility rental office. Taylor Rental – Harry Gordon – 813-310-8618. Table cloths may be rented from SUN ‘n FUN, when available, at $15 per table cloth. For more information, or to book your event, please call our Events Logistic Manager at 863-644-2431 ext. 125 or email eventrentals@flysnf.org. 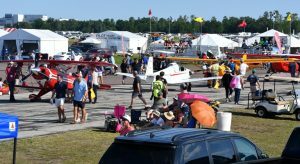 Visit the SUN ‘n FUN campus and discover how 160 acres on the south side of Lakeland Linder Airport offers unique spaces for any event. 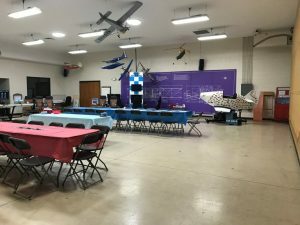 Complete with a covered porch and a close up view of the runway, the Cessna Center is a great location for smaller intimate gatherings or workshops. This venue provides a small kitchen area and private bathrooms. Two small rooms are available for staging or private meetings. With it’s beautiful long windows and inviting atmosphere, the Hospitality Suite is perfect for small wedding parties, business meetings and social gatherings. A catering kitchen is available along with Audio-Visual equipment and other business tools. Standard configuration uses eight rectangular tables, thirty inches by eight feet, maximum of twelve. Alternatively, seven round tables, seating for up to seven people each, are available at no extra charge. Note that the tables do not all have a smooth finish, so table cloths are recommended for all tables. Cloth table cloths are available for rental from Taylor Rental or from SUN ‘n FUN. 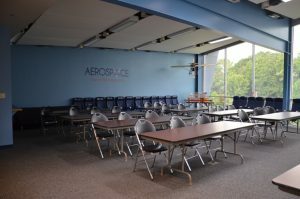 The Piedmont Hangar houses the education department and offers a facility with a hangar door where students or guests can learn the intricacies of aircraft construction and maintenance. Great classroom setting. Any party exceeding the stated capacity must obtain prior permission from the event coordinator or the event will be cancelled. For more information, or to book your event, please call our Events Logistic Manager at 863-644-2431 ext. 125 or email eventrentals@flysnf.org. Designed for residential summer camps, educational workshops, and youth activities in a group setting. This building is equipped with classrooms, a full kitchen, dormitories, large screened patio, restrooms and showers. Tables and chairs must be rented or SUN ‘n FUN’s picnic tables (seat 10 people each) can be provided for an extra charge. Porta Potty rental is necessary. For more information, or to book your event, please call our Events Logistic Manager at 863-644-2431 ext. 125 or email eventrentals@flysnf.org. Drape the room or use the ambiance of a functional aircraft restoration facility to make a memorable theme your guests won’t quickly forget! Share Your Next Event With Us!